This week I sat down with John Lewis ’17, a member of the sailing team who took third in the A division alongside Robert Floyd ’17 at the George Morris Trophy hosted by Boston University. This past weekend, the sailing team finished 10th overall at the New England Championship. How has your season personally been this year? JL: It’s going alright. Not bad. As someone who doesn’t know much about sailing, I have to ask: How long is the typical season? JL: The season comprises the fall and then the spring. So do you train a lot over the winter? JL: We have lift twice a week, but we don’t have actual practice since the lake is frozen over. The lake just thawed last week. JL: Since I was really young. I would sail a lot during the summers up on Long Island Sound with my cousins. JL: During the summers I would usually go visit my family up in Connecticut, and they all sailed. My parents sailed when they were younger, so I just started doing it over the summer. It caught on, and I kept going with it. Was sailing a factor in your decision to come to Dartmouth? JL: Not really. I thought about sailing when I was applying, but it wasn’t a deciding factor in going here. JL: True. Best state in the Union. Have you had to make any adjustments while sailing in New England? JL: Well, it’s cold here. I mostly used to sail up on Long Island Sound and in Connecticut over the summers. I hadn’t really sailed where it was this cold though, so that’s one adjustment I’ve had to make — with dry-suit sailing and the like. What do you enjoy most about sailing? JL: It’s fun being out on the water, making things go fast. It’s a fun, relaxing thing to do. Would you say sailing is more of a physical sport or a mental sport? JL: I guess mostly mental, but also physical. There’s strategy and tactics on the water, but also there’s the physical aspect in that you have to be able to control the boat in windy, high-powered situations. There’s also the mental determination involved in being able to fight through freezing, snowy days. What would you say to people who are on the fence about taking sailing as a P.E. course? JL: Do it. It will be fun. You get to chill on the lake, learn how to sail, meet some fun people and have the time of your life. It’s the best decision you’ll make at Dartmouth. Everyone who has done it who has said it’s the best P.E. 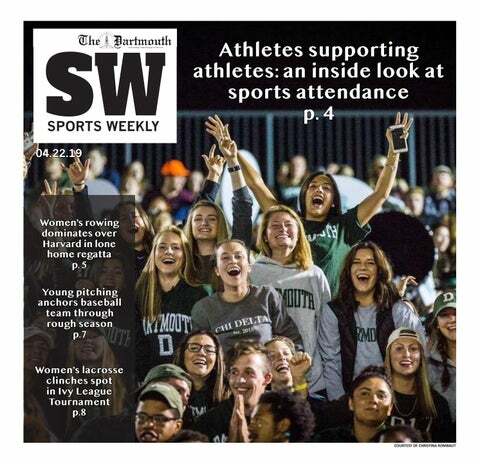 class they’ve taken — and even the best activity at Dartmouth. All of the upperclassmen who have done it have recommended it. Where do you see yourself going with sailing after Dartmouth? JL: I don’t know. Probably just sailing casually. I don’t have any plans on doing anything specific with it after Dartmouth, just living the sailing life.